4K resolution is making watching movies and playing games on today's computers a more intense experience than ever before, but changes are coming. A new connector for TVs and monitors could allow laptops and desktops to connect to 8K displays as early as 2018. SuperMHL is a new connector technology that is being proposed by the MHL Consortium primarily for use in TVs, set-top boxes, DVD players, streaming sticks and gaming consoles. But device makers could put SuperMHL ports in laptops and desktops, which could also display 8K content. pixels. SuperMHL is much like HDMI, but the technology will give computers a new port and cabling system to connect to 8K displays. It's still early days for 8K, and its adoption today is similar to what 4K was a few years ago, said Gordon Hands, president of the MHL Consortium. Broadcasters are still testing content delivery, and the 2018 FIFA World Cup and 2020 Tokyo Olympics are expected to be broadcast in 8K. The MHL Consortium is showing a 98-inch LG TV with SuperMHL technology at the CES trade show this week. Big-name TV makers like Samsung, LG, Toshiba and Sony are backing SuperMHL, and the first TVs with SuperMHL ports could ship by the end of this year or early 2017. Hands was confident that 8K TVs would start trickling into the market latest by 2018, and by 2020 the technology would go mainstream. Device makers are showing interest in SuperMHL, but it isn't clear yet when PCs with the ports would come out. Hands estimated 2018 or later. There are benefits of having the SuperMHL port in computers, Hands said. A lot of 8K content development and movie making could take place on high-end desktops. A SuperMHL connector would help the desktops to connect to 8K TVs or monitors, Hands said. The first products with the SuperMHL port could replace HDMI ports, which supports up to a 4K resolution. But most PCs today can't handle 8K video, and will need beefy graphics cards to deal with that resolution. But some software makers are ready. Microsoft has already said it will support the 8K resolution with Windows 10. The SuperMHL connector will be able to transfer video at 120 frames per second at 48 bits of color, which requires a maximum speed of 270Gbps (bits per second). Current SuperMHL technology supports compressed video transfers at 120 frames per second and 36 bits of color, but it will continue to evolve to support higher bandwidth, frame rates and color depth, Hands said. 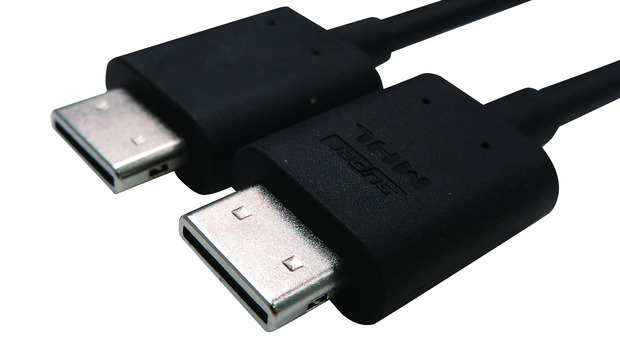 As an alternative to the full-fledged port, the SuperMHL protocol could also be slapped on the versatile USB Type-C cable. But the data transfer rate will be much lower, which could affect the frames per second and color depth. It'll be up to device makers to make the USB Type-C cable compatible with the SuperMHL protocol, Hands said.